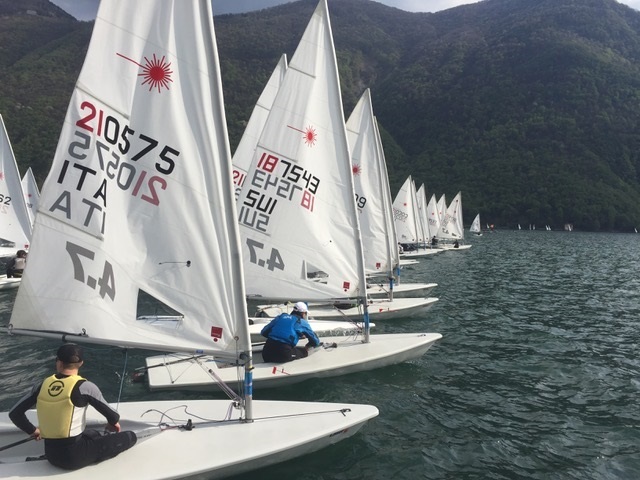 The sun was there but nevertheless, the Lake Lugano thermal breeze did not really materialise, just enough to complete one race per Gold- and Silverfleet in an up to 7 kn wind. Federica Catarrozzi ITA confirmed her superiority in the Lasers 4.7 with another race win. Matteo Guardigli ITA and Giorgia Cingolani ITA at equal points completed the podium. 75 participants from 8 nations. The clear winner in the Lasers Radial was Guido Gallinaro ITA ahead of Alberto Tezza ITA and Alessandro Fornassari ITA. 63 participants from 9 nations. A class of his own was Marco Gallo ITA in the Lasers Standard with 5 bullets in 7 races ahead of Francesco Piro ITA and Michele Vezzoli ITA on the ranks 2 and 3. 13 participants. All ranking lists and the event facebook page.